Professor Moe Win has been promoted to full professor. The department has appointed Professor Dave Darmofal the Raymond L. Bisplinghoff Faculty Fellow in recognition of his numerous contributions to the Department, the Institute, and profession. Bisplinghoff was a faculty member, AeroAstro department head, and dean of engineering. "I'm honored to be associated with the Bisplinghoff name," Darmofal says. Professor Dave Miller is the new Jerome C. Hunsaker Professor of Aeronautics and Astronautics. He has also been named vice chair of the Air Force Scientific Advisory Board effective October 1, 2012. The SAB, established by General Henry H. "Hap" Arnold and Dr. Theodore von Karman, is a federal advisory committee that provides findings and recommendations to the secretary and chief of staff of the Air Force with respect to science and technology. This includes review and evaluation of the long-range plans for research and development, advising on the adequacy of the Air Force research program, and conducting studies designed to improve the Air Force R&D program. Dr. Alvar Saenz-Otero, associate director of the Space Systems Lab, has been promoted to principal research scientist. In making the announcement, AeroAstro head Professor Jaime Peraire wrote, "Alvar is an expert in avionics and has made important contributions in nano-satellite development and technology research aboard the International Space Station. Alvar is a major contributor to our educational program. He has been the avionics mentor for the past five CDIO Capstone Design classes (16.83x) and he is responsible for the creation of the Zero Robotics competition for STEM education, which has had a remarkable success." Professor Youssef Marzouk is the new Class of 1943 Career Development Chair. The Wings Award: To recognize an individual support staff member in AeroAstro for excellence - Marilyn Good, Space Systems Lab administrative assistant. The Spirit of XVI Award: An annual award to one individual or team of staff members in Aeronautics and Astronautics, whose work, commitment and enthusiasm contribute significantly to the achievement of the mission of the department. Alan Natapoff, Man Vehicle Lab research scientist. The Vickie Kerrebrock Award: To recognize students, staff, faculty or others, either individually or as members of a group, who have made significant contributions to building a sense of community. Individual: Helen Halaris, Mass. 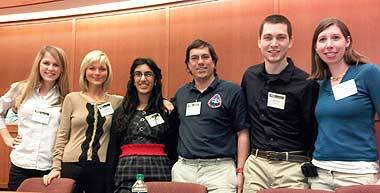 Space Grant coordinator; Group: Women's Graduate Association of Aeronautics and Astronautics. 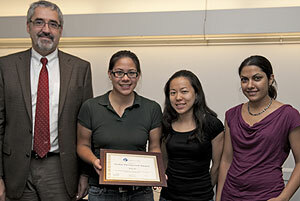 Accepting the Kerrebrock Award are WGA^3 executive committee members (from left) Sunny Wicks, Chelsea He, and Sameera Ponda. Marie Stuppard, the department's academic programs administrator received the Ellen J. Mandigo Award. This award recognizes staff who have "demonstrated intelligence, skill, hard work, and dedication to the institute." Jean Sofronas, administrative assistant to Professors Peraire and Willcox, received the Infinite Mile Award for Excellence, which is presented to people "whose work is of the highest quality. They stand out because of their high level of commitment and because of the enormous energy and enthusiasm they bring to their work." AeroAstro Senior Lecturer Dr. Rudrapatna V. Ramnath flew to India earlier this year to receive the International 2012 Glory of India Award at a celebration in New Delhi. This prestigious award was presented in recognition of his "meritorious services, outstanding contributions, and remarkable role" in Aerospace and other areas over many years in the US and India. 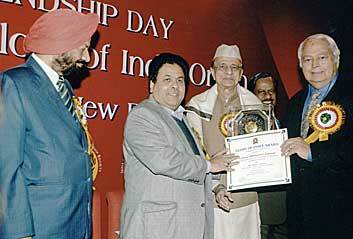 Radrapatna Ramnath (right) receives the Glory of India Award at a ceremony in New Delhi. Yvnge Raustein Award: given to a Unified Engineering student who best exemplifies the spirit of Yngve Raustein and to recognize significant achievement in Unified Engineering: George Pantazis. 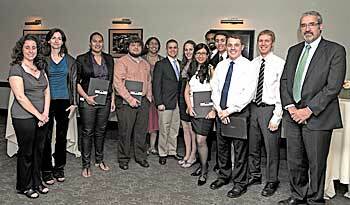 Lockheed Martin Prize for Excellence in Systems Engineering Teamwork: the REXIS Student Team: Mark A. Chodas, Ezekiel L. Willett, Nathaniel E. Keegan, Rachel W. Williams, Edward E. Whittemore, David C. Sternberg, Jennifer N. Quintana, Angelica Ceniceros, Vamsi K. Aribindi, Angelica Cardona, Megyery Zsuzsa, Jesus A. Zuniga, Lisa K. Johnson. United Technologies Corp. Prize: awarded to an AeroAstro student for outstanding achievement in the design, construction, execution, and reporting of an undergraduate experiment: Alejandro F. Arambula and Marissa A. Good. Admiral Luis De Florez Prize awarded for "original thinking or ingenuity": Christian A. Valledor and Andrew Wimmer. James Means Award for Excellence in Flight Vehicle Engineering: Jedediah M. Storey. James Means Award for Excellence in Space Systems Engineering: Mark A. Chodas and Ezekiel L. Willett. Henry Webb Salisbury Award: given in memory of Henry Salisbury to a graduating senior who has achieved superior academic performance in the Course XVI Undergraduate Program: Rachel W. Williams. AeroAstro Graduate Teaching Assistantship Award: given to a graduate student who has demonstrated conspicuous dedication and skill in helping fulfill an undergraduate or graduate subject’s educational objectives: Anne D. Marinan. AeroAstro Undergraduate Teaching Assistantship Award: given to an undergraduate student who has demonstrated conspicuous dedication and skill in helping fulfill an undergraduate subject’s educational objectives: Steven M. Ojeda. AIAA Undergraduate Advising Award: given by the AIAA Student Chapter to a faculty or staff who has demonstrated excellence in serving as an academic or 16.621/16.622 advisor and has made a positive impact on a student’s time: Prof. Sheila M. Widnall. The AIAA Undergraduate Teaching Award: given by the AIAA Student Chapter to a faculty or staff member who has exemplified the role of a “great teacher”: Prof. Olivier L. de Weck. The REXIS team accepts the Lockheed Martin Prize for Excellence in Systems Engineering Teamwork. Alan Epstein, Vice President Technology and Environment at Pratt & Whitney and the AeroAstro R.C. Maclaurin Professor of Aeronautics and Astronautics, Emeritus is the recipient of the 2013 Dryden Lectureship in Research Award. Two honors for doctoral student Anton Aboukhalil. He has won the MIT-ASO Science and Technology Graduate Student Achievement Award, which recognizes the academic and leadership achievements of outstanding graduate students with Arabic heritage in U.S. universities. He has also been selected to attend the 2012 International Graduate Summer School in Aeronautics and Astronautics, organized by Beihang University (formerly Beijing University of Aeronautics and Astronautics), and the National Laboratory of Aeronautics Science and Technology. Leveson says that the class is appropriate for all engineers who will be designing and building complex systems and also for those who want to work as a system safety engineer. The Astronaut Scholarship Foundation has named Mark Van de Loo the 2012 MIT recipient of its $10,000 fellowship. Professor Jeff Hoffman, who chairs the scholarship committee (and recused himself from the decision process) says, "This is the first year that MIT has participated in the ASF program, and I am delighted that the winner is an AeroAstro student!" This is the largest U.S. undergraduate merit-based scholarship on record, Hoffman says. 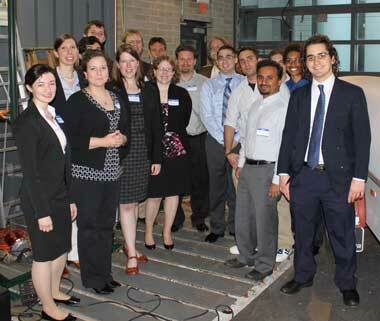 Congrats to the winners of this year's AeroAstro grad student association's PhD research competition, David Lazzara (1st place) - "Modeling and Sensitivity Analysis of Aircraft Geometry for Multidisciplinary Optimization Problems," Alessandro Golkar "A Framework for Systems Architecting under Ambiguous Stakeholder Objectives," Sameera Ponda - "Robust Distributed Task Allocation for Autonomous Multi-Agent Teams"
Check out the latest video in the TechTV AeroAstro collection: CubeSats: Tiny Satellites work at MIT, U. Michigan. Produced by grad student Gwen Gettliffe for last week's CubeSat conference, which grad student Alessandra Babuscia and others organized at MIT. Rachel Ellman, an AeroAstro alum now in the HST bioastronautics PhD program, has won the AIAA Foundation Orville and Wilbur Wright Graduate Award, reports Prof. Larry Young. In a recent Chemistry World article Professor Steven Barrett discussed how desulfurising jet fuel would reduce its health impact ... but may increase its climate impact. Unified Engineering students modify and fly radio-controlled aircraft in competition. This year, the students were tasked to design an aircraft which can "pull Gs" while carrying payload, in some optimum combination. 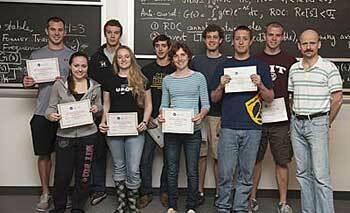 2012 winners are (front, from left) Morganne C. Klein, Mia N. Stevens, Kathleen M. Hoza, James J. Krasner, Prof. Mark Drela (back, from left) John C. Wenzel, Michael R. Klinker, Benjamin S. Frank, Joseph, Marcel Williams, Alexander R. Nelson. Not pictured are Thane Miller and Jay Pothula. AeroAstro alumna Dr. Danielle Wood writes that the International Astronautical Federation has named her a recipient of the Young Space Leaders Award. The award recognizes Wood's unique research on international space activity and her volunteer efforts for the space community. Wood will be honored as part of the October 2012 International Astronautical Congress in Italy in October. Wood is working as a post-doctoral researcher at Johns Hopkins Applied Physic Laboratory at John Hopkins researching how developing countries build their first satellites through partnerships with established firms in other parts of the world, and in this process, grow an internal domestic capability for engineering a satellite system. Welcome to new staff member Joyce Light, an administrative assistant in department headquarters. Joyce comes to AeroAstro from Boston College where she was director of administration in physics at BC. Also, welcome to Anthony Zolnick, the department space manager. Previously, he was on the CSAIL staff where he held a similar position. AeroAstro bids farewell to Sue Whitehead, our coordinator for development and strategic initiatives in department headquarters. Sue is leaving "to better focus on my studies as I prepare for ordination as an interfaith minister in June of 2013." This spring marks the 80th anniversary of the first woman to receive an SB from MIT Aeronautics. Isabel Ebel graduated from MIT in 1932 – the only woman studying aero engineering among a student body of 30 women and 3,000 men. Unable to find work with an American aircraft company, she returned to school at the Guggenheim School of Aeronautics at NYU which admitted her as its first woman student only after Amelia Earhart, who Ebel had helped plan her 1932 record-setting transcontinental flight, intervened. Ebel was finally hired in 1939 by Grumman where she worked on several airplanes, concentrating on the XF5F-1. Several years later, she was hired by United Airlines as a research engineer. [Some of this information from "Women and Flight Since 1940" (2004) by MIT Museum curator Deborah Douglas]. Space Systems Lab members at the recent Harvard Business School Program "Space: The Business Frontier" included (from left) graduate students Gwen Gettliffe, Ingrid Beerer, and Farah Alibay; Research Scientist Dr. Alvar Saenz- Otero; grad student Alex Buck; and Professor Kerri Cahoy. Members of the Air Force Research Laboratory review panel visited MIT for an all-day Critical Design Review of MIT's team entry into the University Nanosatellite Program-7 competition, called TERSat (Trapped Energetic Radiation Satellite). MITers and AFRLers are (from left) Anne Marinan (MIT), Kerri Cahoy (MIT), Christina Doolittle, Julian Lemus (nearly blocked - MIT), Brian Coffee (taller, nearly blocked- MIT), Emily Clements (MIT), David Voss (glasses, back), Greg Ginet (beard, back), Mandy P., Stan Straight, Dave Cooke, Christian Valledor (MIT), Naomi Lynch (nearly completely blocked), Capt. Rob Small, Aporva Bhopale, Eric Peters (nearly blocked - MIT), Leo Tampkins (MIT), Bruno Alvisio (MIT). Kerri notes that they need to line up better in the future to make for easier photo identification! Don't wait for your enews and emails — keep up with AeroAstro news as it happens — follow the department on Twitter and Facebook. If you know of events, honors, activities, or other information you'd like to see in the next issue of AeroAstro enews, please send to wlitant@mit.edu — we'd be pleased to include your submissions.